The Hamptons at Tampa Palms was constructed in 1996, purchased by Zapolski + Rudd in 2003 and sold as part of a syndication program to Tenant In Common investors in 2004. It is a 315-unit luxury garden apartment community in Tampa, Florida consisting of 52 two-story residential buildings and a two-story clubhouse. It totals a net rentable area of 436,824 square feet spread out across 23 lakeside acres. 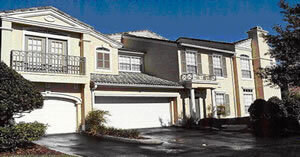 This community is well located at a desirable address in Tampa. Given that the property offers large floor plans, direct access garages, a heated fountain swimming pool, fitness club, and substantial on site amenities the property was later purchased by a third party for conversion to for sale condominiums.